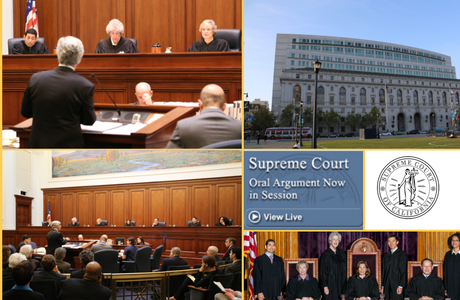 Link to the live webcast will be posted 15 minutes before arguments begin. The following cases are placed upon the calendar of the Supreme Court for hearing at its courtroom in the Ronald M. George State Office Complex, Earl Warren Building, 350 McAllister Street, Fourth Floor, San Francisco, California, on March 7 and 8, 2017. #15-24 People v. Gonzalez (Mario Alberto), S223763. (E059859; 232 Cal.App.4th 151; Superior Court of Riverside County; INF1300854.) Petition for review after the Court of Appeal reversed an order dismissing counts in a criminal case. This case presents the following issue: Can nonverbal, threatening gestures constitute a “statement, made verbally, in writing, or by means of an electronic communication device” as required for making a criminal threat in violation of Penal Code section 422? #14-105 Wheatherford (Cherrity) v. City of San Rafael et al., S219567. (A138949; 226 Cal.App.4th 460; Superior Court of Marin County; CIV1300112.) Petition for review after the Court of Appeal affirmed the judgment in a civil action. This case presents the following issue: Must a plaintiff have paid or be liable to pay a property tax to a government entity in order to bring a taxpayer waste action against that entity under Code of Civil Procedure section 526a, or can the payment of other taxes confer standing? #15-73 People v. Gutierrez (Rene), and Consolidated Case, S224724 (Formerly listed as People v. Enriquez (Ramiro), which is now S240419, and will be deferred pending consideration and disposition of related issues in Gutierrez and Ramos or pending further order of the court.). (F065288; F065481, F065984; nonpublished opinion; Superior Court of Kern County; BF137853C.) Petitions for review after the Court of Appeal affirmed judgments of conviction of criminal offenses. In this case in which review was previously granted and briefing was deferred pending further order of the court and decision in People v. Elizalde (2015) 61 Cal.4th 523 and People v. Prunty (2015) 62 Cal.4th 59, the court ordered briefing on the following issue: Did the Court of Appeal err in upholding the trial court’s denial of defendants’ Batson/Wheeler motions? #14-104 People v. Martinez (Dennis Terry), S219970. (E057976; 226 Cal.App.4th 1156; Superior Court of San Bernardino County; FMB1200197.) Petition for review after the Court of Appeal affirmed in part and reversed in part a judgment of conviction of a criminal offense. This case presents the following issue: Can a defendant, who is convicted of hit-and-run and sentenced to prison rather than placed on probation, be required to pay restitution for the injuries the victim suffered in the collision? #15-48 Williams & Fickett v. County of Fresno, S224476. (F068652; 232 Cal.App.4th 1250; Superior Court of Fresno County; 13CECG00461.) Petition for review after the Court of Appeal reversed the judgment in a civil action. This case includes the following issues: (1) Must a taxpayer against whom an escape assessment on personal property has been made exhaust administrative remedies by filing an application with the county’s board of equalization to reduce the assessment if the taxpayer claims that it does not own and has no interest in the assessed property, or does the taxpayer fall within the “nullity” exception to the exhaustion requirement? (2) Is a taxpayer who files an application for changed assessment with the county’s board of equalization subject to a one-year limitations period for paying the assessment and filing an action challenging the assessment, or does the period within which the taxpayer may file such an action begin to run only after the taxpayer has paid the disputed taxes? #16-127 Leider (Aaron) v. Lewis (John) et al., S232622. (B244414; 243 Cal.App.4th 1078; Superior Court of Los Angeles County; BC375234.) Petition for review after the Court of Appeal affirmed the judgment in a civil action. The court limited review to the following issues: (1) Does Civil Code section 3369 bar taxpayer actions brought under the authority of Code of Civil Procedure section 526a seeking to enjoin violations of Penal Code provisions concerning animal abuse? (2) Does the law of the case doctrine foreclose petitioners’ reliance upon that legal argument in this appeal? #15-42 Dhillon (Jatinder) v. John Muir Health et al., S224472. (A143195; nonpublished opinion; Superior Court of Contra Costa County; MSN131353.) Petition for review after the Court of Appeal dismissed an appeal from an order on a petition for writ of administrative mandate. This case presents the following issue: Is a trial court order granting in part and denying in part a physician’s petition for writ of administrative mandate regarding a hospital’s disciplinary action and remanding the matter to the hospital for further administrative proceedings an appealable order?